*As an Amazon Associate we earn from qualifying purchases. The way we solve problems is broken—we’re trapped by techniques and assumptions of a prior era. Today challenges emerge at an ever-accelerating rate, and we struggle to find the imaginative answers we crave. When we do, biology and culture conspire to obstruct our progress. 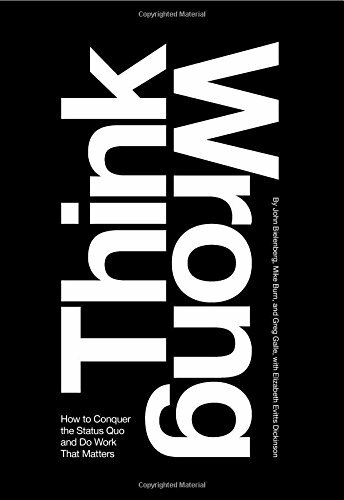 Think Wrong: How to Conquer the Status Quo and Do Work That Matters teaches you how to use Solve Next’s radical problem-solving system to reliably produce surprising, ingenious, and seemingly magical answers to your most wicked questions. This book provides you with new language, frameworks, and tools to conquer the status quo and drive change. Inside Think Wrong, designers and innovators John Bielenberg, Mike Burn, and Greg Galle show how pioneering teams of people have cultivated ways to challenge both their brains and the culture at large. These people learned to think wrong, and so can you. The introduction offers the fundamental groundwork of Think Wrong. The subsequent chapters present six practices developed by the authors—Be Bold, Get Out, Let Go, Make Stuff, Bet Small, and Move Fast. Using firsthand case studies of success, and offering Think Wrong Drills that you may use, Think Wrong is a field guide for applying this highly effective problem-solving system to challenges big and small. In addition to the drills provided in the book, Think Wrong readers are provided access to free online resources.